Return of the Useless (1918), by George Bellows, is an example of a kind of artistic imagery used to galvanize reluctant Americans into joining World War I. The scene shows German soldiers unloading and mistreating imprisoned civilians after their return home to Belgium from German forced-labor camps. On the eve of World War I, the U.S. government under President Woodrow Wilson opposed any entanglement in international military conflicts. But as the war engulfed Europe and the belligerents’ total war strategies targeted commerce and travel across the Atlantic, it became clear that the United States would not be able to maintain its position of neutrality. Still, the American public was of mixed opinion; many resisted the idea of American intervention and American lives lost, no matter how bad the circumstances. 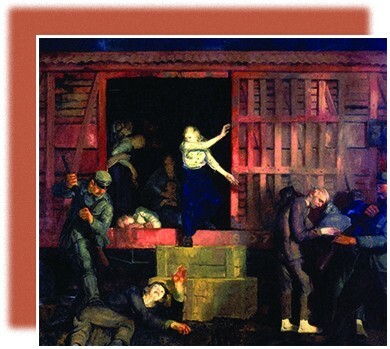 In 1918, artist George Bellows created a series of paintings intended to strengthen public support for the war effort. His paintings depicted German war atrocities in explicit and expertly captured detail, from children run through with bayonets to torturers happily resting while their victims suffered. The image above, entitled Return of the Useless, shows Germans unloading sick or disabled labor camp prisoners from a boxcar. These paintings, while not regarded as Bellows’ most important artistic work, were typical for anti-German propaganda at the time. The U.S. government sponsored much of this propaganda out of concern that many American immigrants sympathized with the Central powers and would not support the U.S. war effort.